Debate about a sweeping criminal justice overhaul bill favored by Republicans and Democrats is now focused on the size and scope of potential changes, but there are reasons to doubt its passage this year. Some congressional aides and members of the advocacy community involved in the overhaul effort say they remain upbeat about Obama signing a measure into law -- possibly before Congress adjourns for a prolonged summer and campaign season break. Still, some sources say, with one month of a truncated election-year legislative calendar already gone and the politics of an election year overlapping the legislative calendar, the prospects for the kind of soup-to-nuts bill Obama and some senior Republicans want appear to be fading. “Advocates are really stressing the need to ensure the bill addresses a large number of people,” one Senate Judiciary Committee aide said. But some involved in the debate say the final bill could be a pale reflection of what its proponents originally hoped for. As 2015 wound down, President Barack Obama and senior Republican lawmakers described the bill as having perhaps the best chance of being passed during 2016, his final year in office and a national election year. But such upbeat public prognostications have lost steam. Obama discussed the issue, as well as others, with Speaker Paul D. Ryan, R-Wisc., and Senate Majority Leader Mitch McConnell, R-Ky., during a closed-door meeting Tuesday at the White House, according to press secretary Josh Earnest. 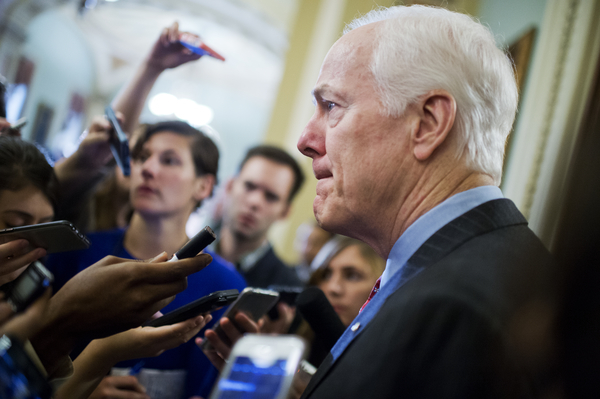 Senate aides say Judiciary Committee Chairman Charles E. Grassley, R-Iowa, and GOP Whip John Cornyn, R-Texas, are working behind the scenes to allay concerns voiced recently by members of their caucus. A criminal justice bill that passed the Judiciary Committee late last year, 15-5, with Republican and Democratic support would, among other things, lower mandatory minimum sentences for certain drug offenders, target violent criminals and hand judges more say in doling out sentences for less-serious crimes, according to a committee fact sheet. Some Republicans in recent weeks have expressed concern the measure would mean “you would throw open the gates of the prisons and simply release a bunch of people -- but that’s not the case at all,” said Todd Cox, a senior fellow at the Center for American Progress. “Grassley and Cornyn, and advocates of the Senate criminal justice reform bill, are working hard to educate people about what the bill would actually do -- and not do,” Cox said. The duo must do so before the bill could hit the Senate floor. Congressional advocates of the bill are also talking behind closed doors about several remaining issues, including the extent to which a final compromise package will alter mandatory minimum sentences. Sources involved in the debate believe Grassley, Cornyn and others ultimately will be able to sway enough of their on-the-fence colleagues. “In fact, in some instances, the Senate bill would increase mandatory minimum sentences,” Cox said. Another issue still being debated is known in the legal world as “mens rea,” or criminal intent, defined as “the state of mind indicating culpability which is required by statute as an element of a crime,” according to Cornell University. Cornyn is pushing to include a provision ensuring those who face prosecution actually had the intent to commit a crime. House Judiciary Committee Chairman Robert W. Goodlatte, R-Va., wants it included in a final bill. The White House and other senators do not, arguing it could help corporations sidestep litigation. While Holden said Koch Industries believes “criminal intent standards are very important because people should not go to prison unless they have criminal intent,” he added that it does not “want this issue to sink everything else on criminal justice reform.” It is unclear whether GOP lawmakers will be influenced by the involvement of Koch, which views criminal justice policy changes as a win for civil liberties. Obama has spoken publicly for months about his desire for Congress to pass legislation that eases penalties for some crimes while also making it easier for former prisoners to adjust to life on the outside. Even amid warnings that campaign-trail politics could sink bipartisan work on the measure, it appeared a 2016 possibility. Some lawmakers have expressed concerns about whether the measures working their way through the House and Senate could allow violent criminals to go free. Driving that train is Sen. Ted Cruz of Texas, whose victory in the Iowa GOP caucus on Monday might give him an even bigger megaphone. Last month, Cruz issued a warning to his fellow senators about the Senate bill: "Every one of us who votes to release violent criminals from prison prior to the expiration of their sentence can fully expect to be held accountable by our constituents." Sources on and off the Hill acknowledge Cruz’s comments could complicate efforts to pass a bill this year. But most agreed his tough campaign-trail talk won’t be enough to sink a rare piece of legislation on which Obama and many Republicans agree. Notably, Sen. Rand Paul, R-Ky., has supported criminal justice laws. “If criminal justice reform were put on the Senate floor today, it would pass — it’s just a matter of Republican leadership bringing it up,” said Sarah Trumble of the Third Way think tank. “Whether or not they do depends on if they decide to capitulate to the Cottons and Cruzes of the world,” she added, also referring to conservative freshman Sen. Tom Cotton, R-Ark. “The truth of the matter is that what the Senate is talking about passing, while significant, is still small,” Trumble said. But the biggest threat to what is a central piece of Obama’s final-year wish list appears to be the legislative calendar. "There’s just not a lot of floor time left this year,” Cox said. Several sources believe both chambers could finish their work during the late spring months, predicting the Senate will vote first. Ryan has said he supports an overhaul bill. But he has yet to announce whether he will move the issue-specific measures his Judiciary Committee has been approving one by one or as a single package on the House floor. Sources said if the Senate votes on its measure first, that could speed the process of getting a final compromise measure to Obama’s desk before the Nov. 8 elections. Still, congressional aides left open the possibility that, given the level of bipartisan support for updating the country’s criminal justice laws, it could pass during a post-election lame duck session. Contact Bennett at johnbennett@cqrollcall.com and follow him on Twitter at @BennettJohnT. Related: Rand Paul Applauds Obama&apos;s Solitary Confinement Changes See photos, follies, HOH Hits and Misses and more at Roll Call&apos;s new video site. NEW! Download the Roll Call app for the best coverage of people, politics and personalities of Capitol Hill.